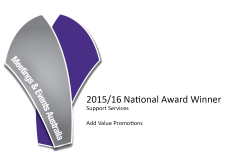 Add ValueÂ is a national company working across Australia to supply promotional products. Headquartered in Adelaide, it has a proven network of reliable suppliers, printers and embroiderers in every state. It has also built up a strong working relationship with several ISO 09000 certified overseas factories, selected because of their reliability and quality of workmanship. It was established twenty years ago and has over 3000 customers. In July 2012, it was bought from its previous owner by staff member Pippa Shanks and her family, to retain the jobs in South Australia. Add Value sources over 30,000 items and also commissions custom made items, including Australian made items, suitable for promotional branding. Manager and part Owner: Pippa Shanks, spent her time at university studying civil and environmental engineering, project management and organising student events. After seven years with Add Value she can cope with any challenge the industry throws her way â€“ 5000 tee shirts branded and delivered in 5 days? 2000 drink bottles to Darwin in 3 days over public holidays? Indie Rock merchandise with different artwork in 5 cities in 8 days? â€“ not a problem!!! If you have a logistical challenge call Pippa first on 08 8132 3588. She will let you know if it can be done. Rachel came to Add Value from the Riverland over ten years ago. Her people-orientated, country values, conscientious approach is legendary. There is no one in the office who is more knowledgeable about great products, timeframes, supply chains, printing and decorating specifications, and limitations. If everyone else has told you it canâ€™t be done, Rachel will find a way or another option. Melani spent many years organising government conferences, training events and meetings in South Africa before moving to Australia and joining Add Value in 2011. She has four years experience managing production and coordination of promotional items and has built up an extensive knowledge of available products and all the ways they can be decorated, and all the mistakes to avoid. She has instilled her healthy obsession with details and due dates throughout the team. Lauren brings 10 year experience in fitness centres and retail. She has an eye for detail and job organisation. She is meticulously organised and is committed to never missing a deadline. She understands the needs of small business and brings her friendly Darwin style to looking after people and the products they have ordered. Add Value has recently created the position of Procurement Manager to make sure that we are finding the best and most suitable products to support promotional campaigns. Genevieve is rapidly building her knowledge of promotional products as an essential part of a marketing strategy. Director Helen Lindon B.A. B. Social Administration, Dip Fine Arts. Helen worked for over twenty years for both Community Service and Health organisations, as well as State and Federal governments. She was an elected member of the Unley City Council for four years. Helen has a commitment to building strong and resilient communities and has years of experience in running training programs and conferences in the non-profit sector. With a second career in visual arts, she also brings an artistâ€™s eye to the layout, look and finish of branded products. She also runs a cherry farm and understands the challenges of selling in a Shed/Cellar door environment. In 2016 we won both the national and the state MEA (Meetings and Events Industry) 2015/16 awards for excellence in support services to the meetings and events industry. APPA - Australasian Promotional Products Association, the industry body that ensures ethical and product standards are maintained. The Australasian Promotional Product Association (APPA) is the only professional trade association specifically for the promotional products and promotional marketing industry in the Australasian region. APPA was established in 1986 and incorporated in 1988. We promote the development, integrity, professionalism and creativity of the advertising form dedicated to promotional products and promotional marketing ensuring good business practices and the highest industry and community standards. IMPORTANT note to consumers: For over 25 years APPA has supported and served consumers, our members and the wider marketing community. APPA members are the leaders in creativity, professionalism and competitive pricing. Members are bound by the APPA Code of Conduct and APPA Constitution which provides additional consumer protection through its dispute resolution process. MEA - Meetings and Events Australia - MEA is a national, independent not for profit organisation dedicated to servicing the needs of the meetings & events industry and promoting professionalism and excellence in all aspects of meetings and event management. It also promotes the value and effectiveness of meetings and events as an important high-yield sector of business travel and tourism. The Bureau is the peak independent body for business events in South Australia. Itâ€™s membership â€“ approximately 180 businesses and service providers â€“ share a common interest in conventions, exhibitions, incentive tourism and much more. The Adelaide Convention Bureauâ€™s role is to provide assistance and guidance to convention and event organisers through every stage of planning, free of charge. Contact the Bureau: 08 8237 0100.